Chassis manufacturers can't get enough of tempered glass and RGB illumination. 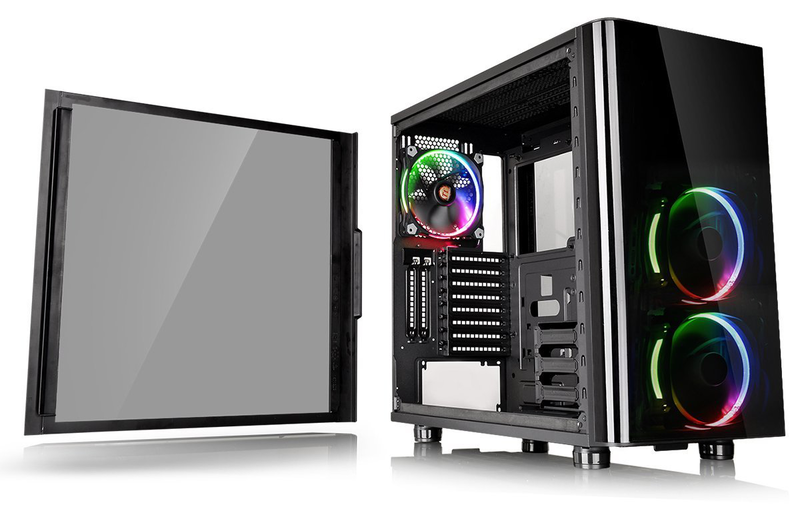 We've already seen the likes of Fractal Design, Cooler Master, Corsair and NZXT try their hand at glass-coated enclosures, and today we turn our attention to the Thermaltake View 31 Tempered Glass RGB Edition. 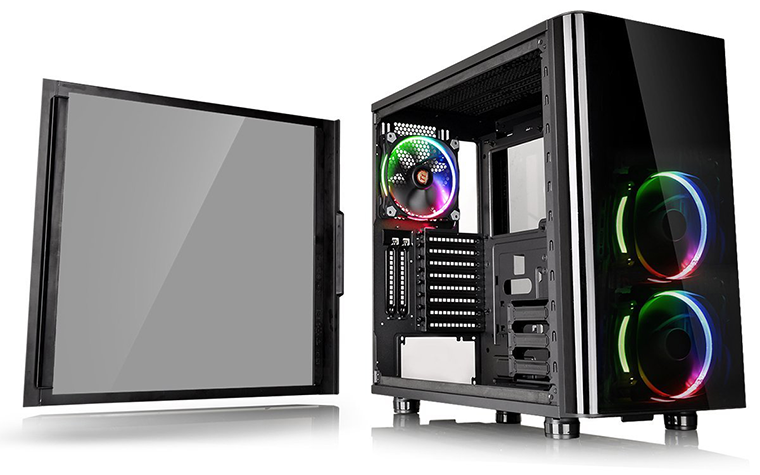 Priced at £110, the View 31 promises "outstanding expandability," 4mm tempered-glass panels on the left and right sides, as well as a trio of pre-installed RGB fans. 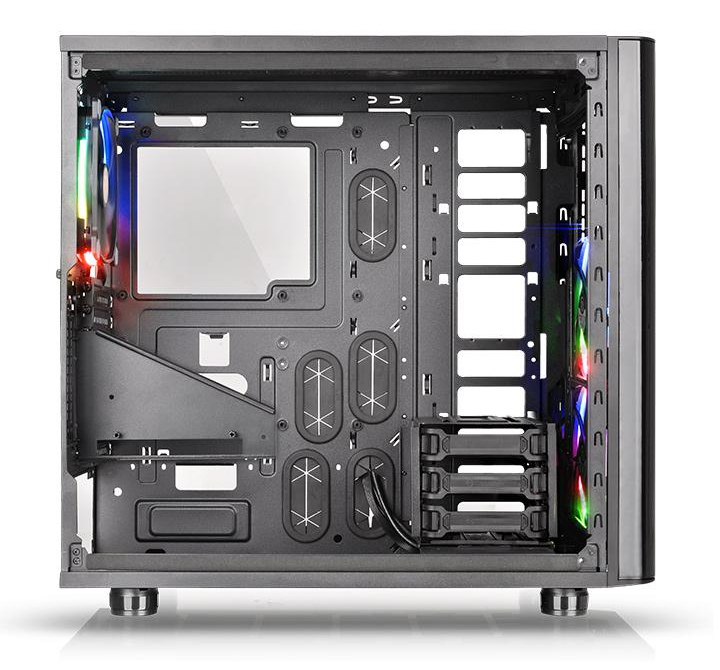 It seems a good deal, and Thermaltake is offering plenty of chassis for your money; while officially classed as a mid-tower, generous proportions of 497mm (H) x 250mm (W) x 511mm (D) ensure that View 31 is roomier than some of its immediate competitors. 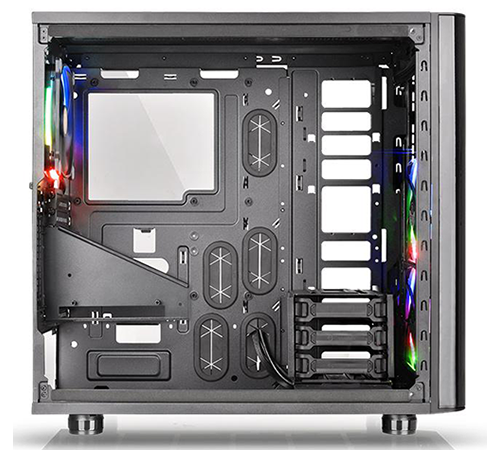 A key requisite for any chassis touting tempered-glass panelling is to look drop-dead gorgeous, and though the Thermaltake is admittedly pretty, it doesn't quite convey a luxury feel. The high-gloss plastic front fascia isn't going to be everyone's cup of tea, there's no shroud to hide the internal PSU, and the different panels come in varying shades of black - there isn't a lot in it, but if you're finickity about such things, you may lament the fact that everything isn't uniform. Build quality is decent but not spectacular, with the thin rear panel exhibiting visible flex when pushed, and View 31 doesn't come with some of the niceties available from the competition. The thumb screws holding the glass panels in place aren't captive, all the bundled screws are lumped together in a single bag, and the hinges on each door are overly shallow, increasing the risk of a side panel slipping off during the build. This isn't a showcase of manufacturing prowess or presentation, yet when you begin to install your components, you find there is plenty to like. 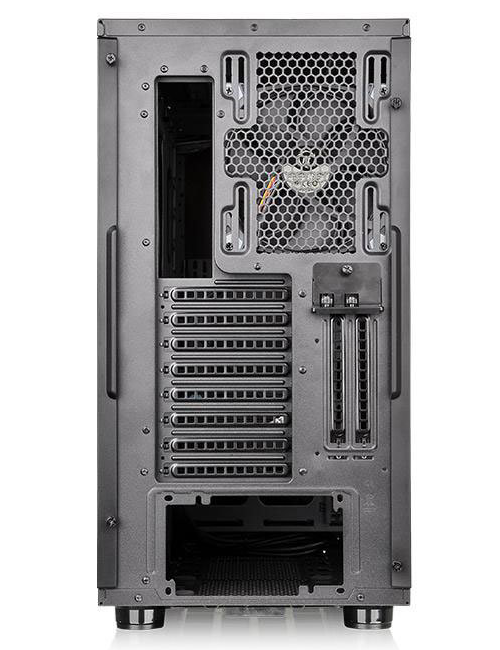 Thermaltake's roomy interior is clean in layout and includes necessary essentials such as a cutout in the motherboard tray, rubber-grommeted cable holes and a modular drive cage that can be relocated or removed with ease. What's available works as intended, but there are some missing features you might expect on a modern enclosure. 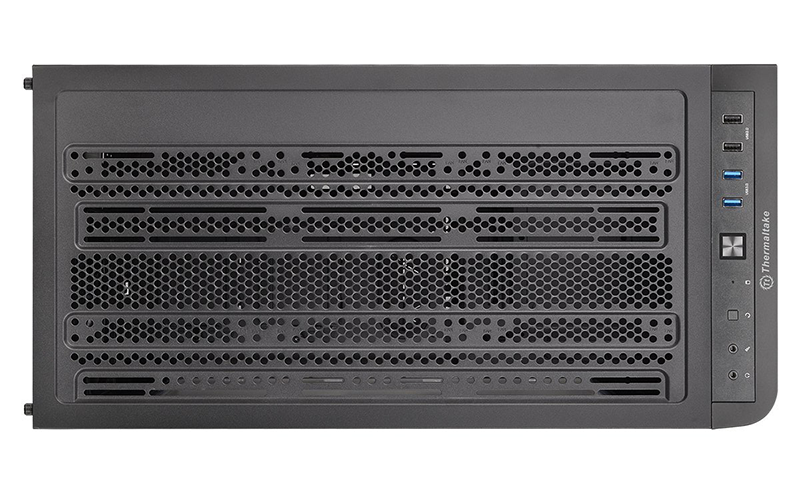 Given the revealing side panel it's a shame not to see the bottom area compartmentalised to keep an unsightly PSU out of view, and though the I/O ports lining the top front edge include dual USB 2.0, dual USB 3.0 and a pair of audio jacks, it's frustrating to see chassis manufacturers dragging their heels on USB Type-C.
What's interesting is the included riser GPU bracket, which attaches to the rear of the case and allows for a dual-slot graphics card to stand proud, taking the weight off the motherboard, reducing the risk of sag, and generally doing a better job of showing off your expensive hardware. 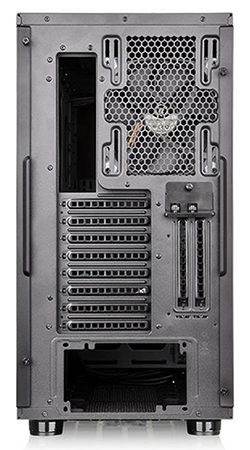 It's a nice idea, in theory, however Thermaltake misses a trick by not including a PCIe x16 riser cable in the box - this optional extra is required if you want to make use of the vertical bracket. Getting our test components installed served up no nasty surprises and View 31 clearly has scope for an ultra-high-end build. There's support for a tower cooler measuring up to 180mm tall, graphics cards up to 420mm in length, and fan-mount opportunities are plentiful. The default trio of 140mm Riing RGB LED fans is configured with dual front intakes and a rear exhaust, but there's also room for two 200s, three 140s or three 120s up top, as well as dual 120s or 140s on the floor. If you wish, the supplied front 140s can also be removed to make way for a single 200 or three 120s. 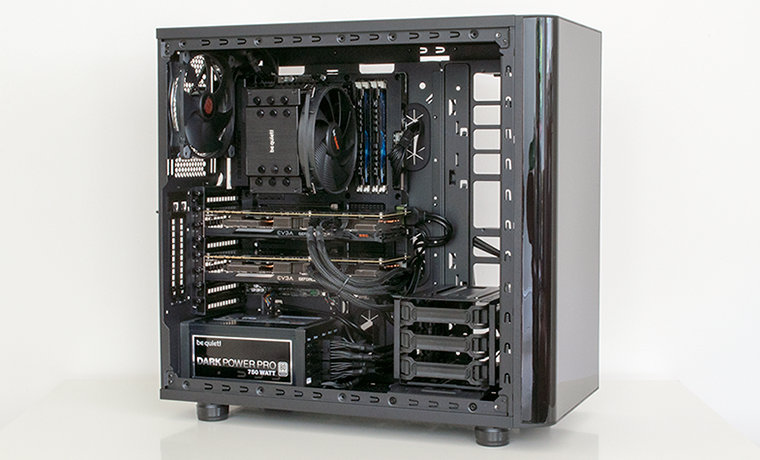 For liquid coolers that means room for up to a 360mm radiator up top or in front, with plenty of space to house a reservoir and pump. With the emphasis on cooling Thermaltake opts to provides only three storage bays. You could argue that the trio of 2.5/3.5in trays is plenty given that most enthusiasts will now employ M.2, but it's a limitation worth knowing about and we aren't overly keen on Thermaltake's implementation. Rather than provide dedicated 2.5in trays on the back of the motherboard panel, View 31 allows for the plastic 3.5in trays to be removed from the hard-disk cage and fastened to the rear of the motherboard. The bulky nature of the trays makes it a less elegant solution, and given the glass side panel, we suspect most users will choose not to have a 3.5in sled on show. Cable management leaves room for improvement, as while there are plenty of holes to navigate cables from front to back and plenty of clearance, there aren't any Velcro straps and with the full-glass side panel there's nowhere for the cables to hide. Elsewhere, the small, three-way Riing fan hub can be attached anywhere in the chassis and allows the user to adjust speed (normal/slow) and colour without having to install any additional software. 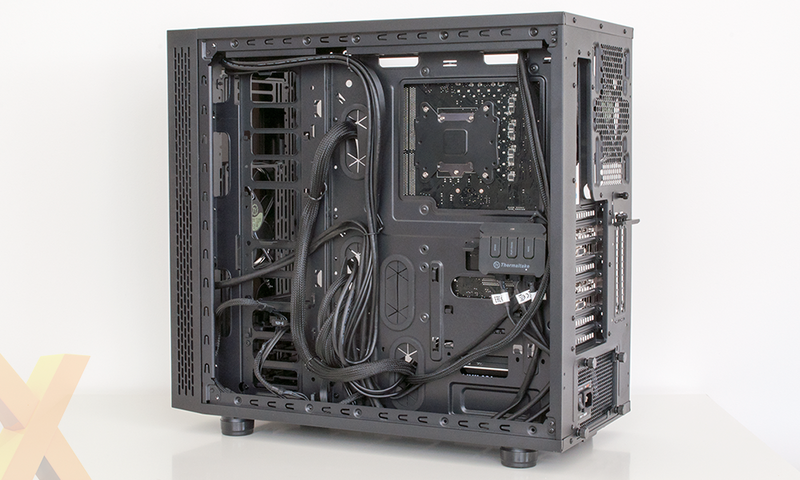 A magnetic dust filter on the roof and a pull-out filter underneath help aid ongoing maintenance, and View 31 has plenty of scope for an elaborate liquid-cooled rig. But there is one more proviso; if the RGB fans aren't essential, Thermaltake offers the same case with two blue Riing fans for just £90.